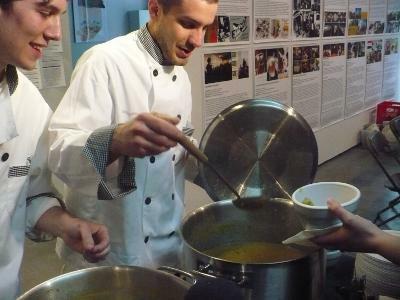 Serving up split pea soup at a Bread! KC dinner in Kansas City. This week we head to Kansas City for a different kind of dinner party—one that is uses a grassroots approach to support the arts. But first, a local look at a national event that’s all about supporting and celebrating the rights of of gay, lesbian, bisexual and transgender people. LGBTQ individuals and their allies celebrated National Coming Out Day this week. KBIA’s Elizabeth Trovall talked to three people about their own experiences coming out of the closet. And it’s a tough time to be an artist. Federal and state governments are cutting back on funding, and, while the art market is improving, it’s still slow. But a group of young Kansas City artists is trying a new way of funding the arts…by feeding people. Alex Smith has the story. Bread! KC has generated over $4,000 in micro grants in the Kansas City area. Their next meal will take place Sunday October 16th at The Kansas City Art institute.